Creative, forward-looking and powerfully grooving Jazz that blurs the lines between composition and improvisation and moves your body as well as you mind. Bassist/Composer Mark Helias has been involved with innovative music making since beginning his career in the mid seventies. He has enjoyed long musical associations with Edward Blackwell, Anthony Davis, Dewey Redman, Ray Anderson, Don Cherry and Gerry Hemingway. Helias has recorded nin albums of his music for three different labels. The first collection "Split Image" (1984), was followed by, "The Current Set" (1987), "Desert Blue" (1989) "Attack The Future" (1992), and "Loopin' the Cool" (1995 ) "New School" (2001) all for enja Records. "Come Ahead Back" (1998), "Fictionary" (1998) have been released by Koch International and GM Recordings. His latest CD, Verbs of Will was released in July, 2003. Mr. Helias had a seventeen year association with the great drummer Edward Blackwell, with whom he recorded two CDs. He has also worked for more than two decades with Ray Anderson and Gerry Hemingway in the ensemble BassDrumBone. Helias' compositional output includes numerous notated pieces ranging from solo bass to symphony orchestra. Since 1981 Mr. Helias has been the recipient of thirteen composition and performance grants. Helias has worked with numerous bands including those of Oliver Lake, Slickaphonics, Arthur Blythe, Abbey Lincoln, Cecil Taylor, Barry Altschul, Don Byron, Marilyn Crispell, Mose Alison and Marty Ehrlich's "Dark Woods Ensemble". In addition to his many performances on records and CDs, Mr. Helias has been producing recordings for other artists on the Gramavision, Enja, New World, Sound Aspects, and Avant/DIW labels. He appeared as a soloist with the New York City Opera in the debut performance of Anthony Davis' opera X, The Life and Times of Malcolm X and with the St. Louis Opera in Davis' "Under The Double Moon". In 1996 he collaborated with director Jay Anania in scoring the feature film The Pagan Book of Arthur Rimbaud. He has recently completed the score for another film directed by Jay Anania entitled, The Citizen. 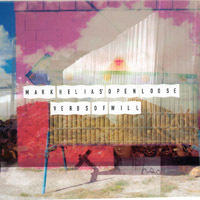 Radio Legs Music is pleased to announce the release of "Verbs of Will" , the new CD by Mark Helias and his group Open Loose. Twelve new Helias compositions performed by Tom Rainey - drums, Tony Malaby - Tenor Saxophone and Mark Helias - bass. Having worked together for more than four years the group has developed an improvisational flexibility which allows it to develop ideas as a unit. The recording was done at the end of a 17 day West Coast Tour in November 2002. It is an excellent representation of a working band conjoining the disciplines of composition, interpretation and improvisation. "Mr. Helias' tightly structured works are launching pads for terrifically energetic sections ... which can wander and expand and contract while still showing great discipline."